The French dominated their home grand prix as Jean-Pierre Jabouille steered Renault to victory at Dijon-Prenois with team-mate Rene Arnoux taking third. The French manufacturer used Michelin tyres and was backed by the French petrochemical giant Elf. The top ten finishers included five Frenchmen. The result was vindication for Renault who had entered Formula One two years earlier with the purpose of exploring the turbocharging alternatives allowed by the regulations. Most were dubious, given the regulations also restricted the engine size for such engines to 1.5 litres, but the victory silenced almost all lingering doubt even though a few pointed out that Renault had exclusively tested at Dijon over the five weeks before the race. In the period since Monaco two big names had dropped out. James Hunt had retired, frustrated with a lack of success and increasingly concerned with the sport's poor safety record, and was replaced at Wolf by Keke Rosberg. Patrick Depailler had suffered serious injuries to his arms and legs in a hang-gliding accident. Ligier barely concealed its anger and openly told the press he was contractually not allowed "to take part in such a dangerous sport." Ligier signed the veteran Jacky Ickx as his stand-in. The slower-starting Renaults, which had occupied the front row of the grid, were easily passed by Gilles Villeneuve's Ferrari at the start and it took Jabouille 43 laps to haul him in, while behind those two Arnoux had recovered from ninth to third. "The car did not handle well at the start on full tanks," Jabouille said. "Then as the tanks got lighter the handling improved and I got into the lead with ease." Three laps from the end Arnoux overtook Villeneuve, but the Renault slowed with fuel starvation and that allowed Villeneuve to attack. The pair went wheel-to-wheel throughout the lap, more than once coming together and swapping places six times before Villeneuve edged second by a matter of feet. "On every corner he got past me as my engine could not pick up the little petrol left in the tank," Arnoux said, while Villeneuve grinned: "That was fun!" On the warm-down lap the two waved at each other in mutual admiration. 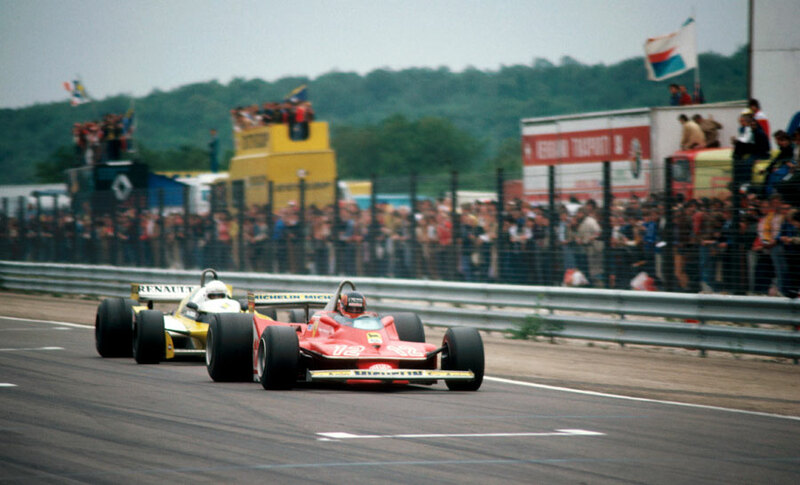 ""He beat me, yes, and in France…" said Arnoux, "but it didn't worry me. I knew I'd been beaten by the best driver in the world." Alan Jones (Williams) took a comfortable fourth despite being relegated from the second row of the grid to the fourth after stewards disallowed his best practice time. Jean-Pierre Jarier (Ligier) took fifth and Clay Regazzoni (Williams) sixth. Lotus' poor season continued as defending champion Mario Andretti quit with brake problems and then Carlos Reutemann hit ninth-placed Rosberg on the final lap.